I got the Android 5.0 (Lollipop) update on Monday and I’ve been miserable ever since. I’ve been an Android user for years, the first android phone I got was running android 2.0 and while it wasn’t the smoothest OS I was in love with it and have stayed with android since. Up until Monday I was running KitKat 4.4.4 on my Nexus 5 and was totally happy, then I saw the update had been pushed to me and I was eager to install and did it right away. Big mistake. First I had to swipe up to get to my lock screen which annoyed me, but I thought I could just change that setting and make the lock screen be the first thing I see when I hit the power button. Nope, you can not bypass this, even if you turn off the notifications all you see is a blank screen that you still have to swipe up to get to your lock screen. I don’t understand why the Android team didn’t turn that off if you disable all notification, instead they decided it would be better to inconvenience people and give them an extra step to unlock their phone with no way to bypass this step. So then I get my phone unlocked and I see the Material Design and the first thing I think is “this looks like a damn iPhone“, personally I think it’s ugly. It’s flat, it lifeless, the icons now look more like paper cut-outs than then clean crisp icons from previous versions. But thing flash up on the screen now instead of simply appearing, never mind that once the window has flashed up the icons are ugly. At this point I’m telling myself I’ll get used to this, I always have before. So I continue to look around and I don’t like what I see. First the keyboard (first image) is ugly and I found I made more mistakes when I typed on it, it’s amazing how changing the color from black to white and removing any separation between the keys can affect your typing. I of course gave up on this new keyboard and went back to the old standard black keyboard which separation between the keys. Now look at the calculator (middle image) that is just ugly, and once again they’ve removed any separation between the keys. Also that teal bar on the side is horrible, it just screams at you and looks totally out of place in the app. Plus there is the fact that once you do your calculation you have to long press delete to clear it, unlike in previous versions where when you tapped the delete button it cleared the screen. Minor thing I know, but I use the calculator several times a day and this gets annoying. Then I see my apps menu, so now instead of thumbnails I have cards, great. Now I have a stack of cards to swipe away that ends in the center of the screen instead of a descending set of thumbnails that can be easily swiped away with my thumb. So by now you can tell I’m not liking Lollipop, but I figure I’ll use it for a few days and get accustomed to the new UI and everything will be alright, then I kept going. Now when I swipe down I see this (first image), and yes it’s different and I prefer the previous pull down menu but this isn’t that bad, the flashlight is useless since I have and app that I don’t have to pull down to get to but whatever, I can live with this. Then I see that when I long press the power button I no longer have to ability to set my phone to vibrate or silent and I no longer have the ability to put my phone in airplane mode. Now I know I can just swipe down to set airplane mode, but the old way was quick and easy, why would they take this out? Also there is no setting that I can find on the pull down menu to set my phone to silence or vibrate, so instead I now have to physically turn the volume down, then back up when I want the ringer back. So I’m really not happy with Lollipop but once again I tell myself that I’ll adapt and everything will be fine. Then apps start crashing, apps that were working just fine before the update are now crashing. And I can understand when third party apps crash after a major update like this, but Gmail and Hangouts crashed! These are the Google apps that should always work with Android, and yet their crashing too! Something tells me the Android team spent more time worrying about how the icons looks and making sure that things flashed on screen with some animation than they did worrying about if the OS even worked. I know Android always has it’s bugs, and I get that, but my Nexus 5 is almost unusable right now. Just to send a text message I have to open Hangouts several times just to have it force close then reopen it and go though that process several times before it will stay open long enough for me to send a text. 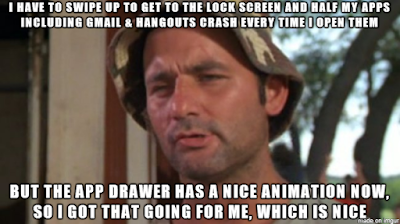 And Gmail gives me a blank inbox for about 30 seconds then force closes all the time, some times it will let me see my email and work properly but most of the time it’s just the blank screen then force close. So I for one do not like Lollipop and wish there was an easy, non techy, way to go back to KitKat. That’s a feature Android should make, the wayback button “Don’t like this flavor of Android? Hit the wayback button and remove the update and go back to your previous version”. I’ve tried to do the whole bootloader thing and I have no idea what I’m doing, and I’m afraid of bricking my phone, so something like the wayback button would be nice, even if it had a time limit, say 7 days, I’d still like an easy way to go back to a stable version of Android. In the end I just wish that the Android team had spent more time making sure Lollipop worked and less time time removing useful things, and making sure the animations flashed.